The wee Monkee passed away today, aged 66, though eternally youthful. Their music and zany escapades are for sure a big part of growing up and maintaining a bright view of life. 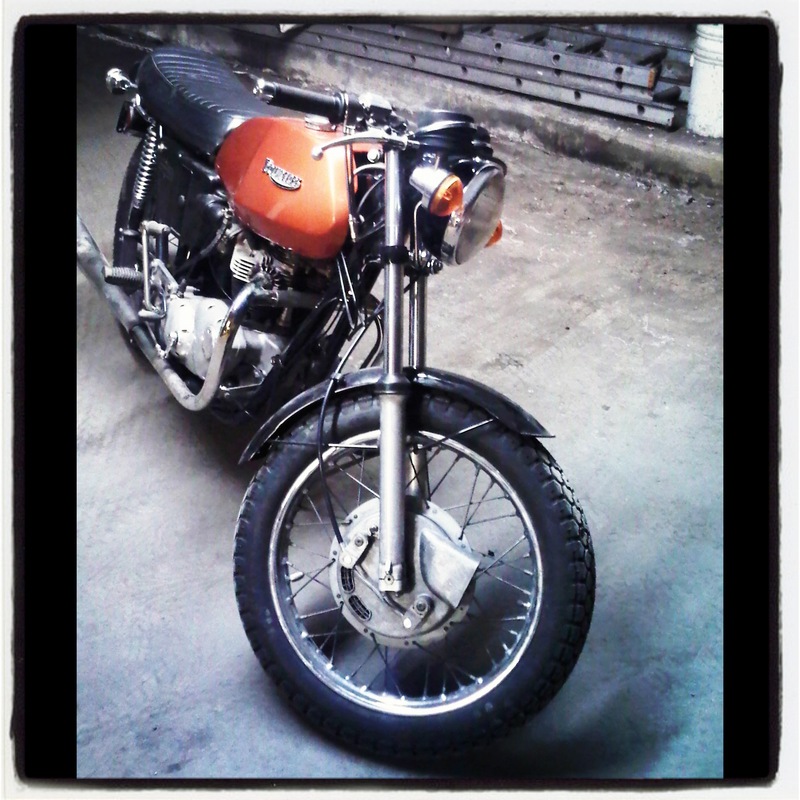 Here he’s on his 60’s Honda CB450 ‘Black Bomber’. So what’s the long face for? A gal and Triumph and a sunny paddock… what more could a gee-gee ask for? This may even have been the poster for this particular race meet, Saturday April 30th being in 1955. Beautiful clean graphics with golden text in mid-century font on black background. It seems ’55 was an important year for Aintree, it was here later that year Stirling Moss won his first Grand Prix driving the powerful Mercedes Benz W196 pipping ‘El Maestro’ Juan Manuel Fangio into 2nd. Exciting Stuff! I’ll bet George Harrison was there too! Lisbeth Salander the hardened protagonist of the Stieg Larsson novel “Girl with a Dragon Tattoo” played with surgical method by Mara Rooney (nominated for an Oscar for her role this year), is given a choice vehicle to scoot about on during her escapades in the movie of the same name. A sweet little black cafe racer number. The cafe’d Honda is a CL 350 (thanks Gogglesdown for clarification); a scrambler style moto from the late sixites -early-seventies. It’s distinctive high pipes a desired look by the kids of the day. For the movie it was given a nice rough cafe treatment, knobbly front tire for the cobbled streets of Stockholm, and slick rear boot for a speedy rort along the country roads. Ace bars, flat black trim finish the goth appearance fit for Lisbeth. 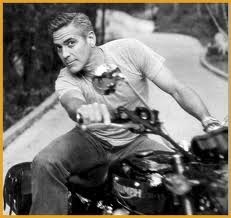 Nominated for Best Actor, here’s wor Geordie Clooney enjoying his Bonnie. 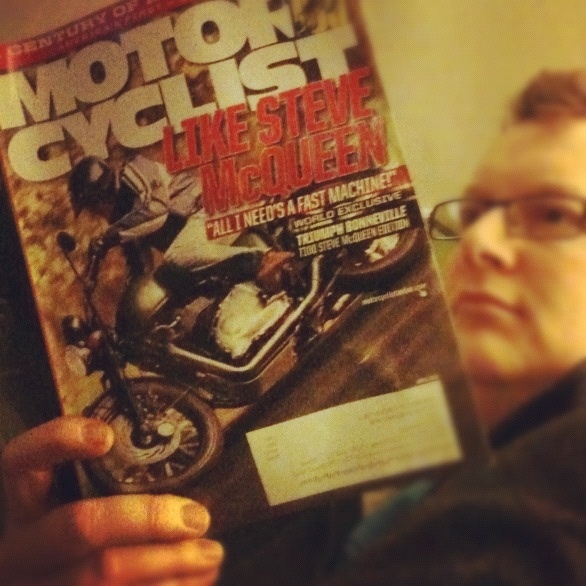 This months edition of Motorcyclist was waiting for me in the mail slot… On the cover none other than Triumphs limited model run of their T100 McQueen special. Only 1100 of these will be built: resplendent in black trim wheels, olive drab tank and plush ‘ISDT ready’ single seat. Border fences to jump anyone? The beat of a Triumph’s heart. 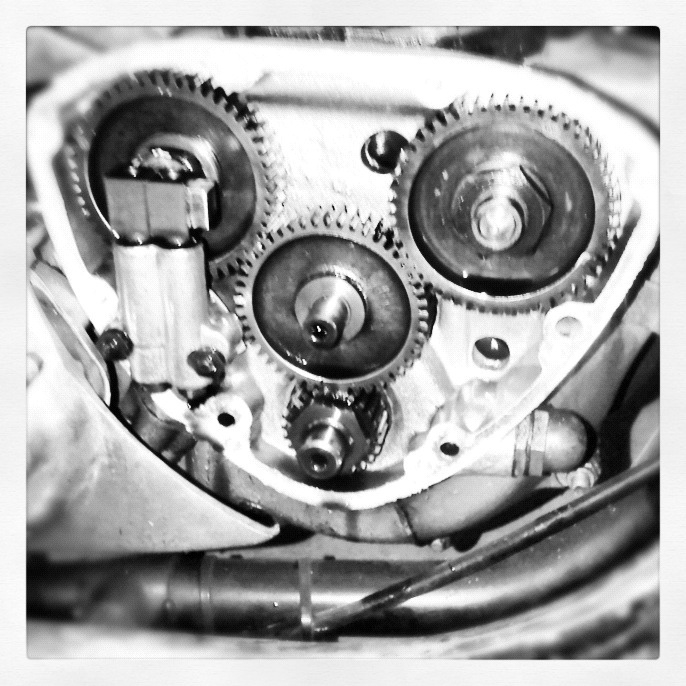 Whilst taking off the timing cover I get to see the timing gear and oil pump. Mechanical Artistry. 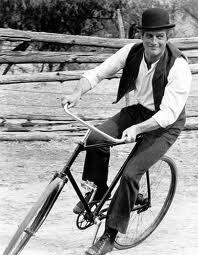 Two-Wheeled fun: here’s the indominable Butch Cassidy tootlin’ around on an early ‘safety’. Bowler hat atop that smilin’ blue eyed outlaw. I know it ain’t a moto but what the heck! Sometimes all you can play is a real ‘Cool Hand’. 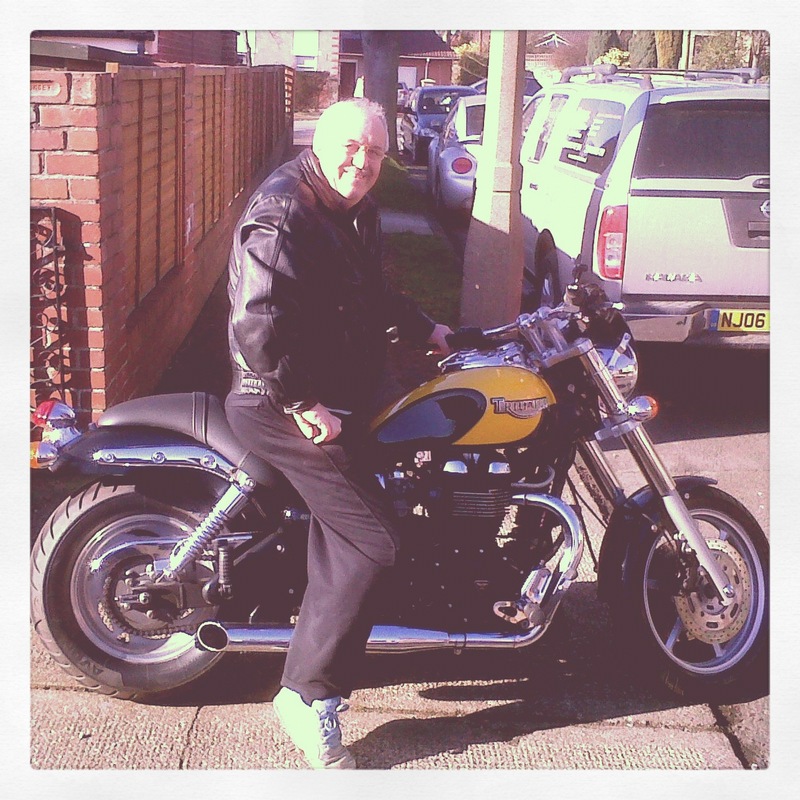 Passing a dedicated owner of this late model Triumph Speedmaster, my father couldn’t help hi’self and ask to sit on it and pose. Looking the part in his leather jacket the ‘bee-loud’ colour scheme certainly looks spiffy. The owner continued his care and attention as Robin moved along. 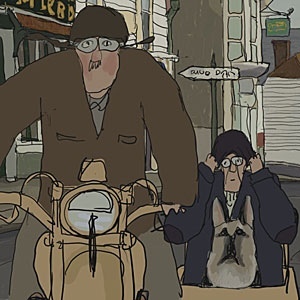 The owner should splash a puddle of oil on the ground under the bike for a little authentic brit-iron character! Plenty of toy AA combinations were available for the young lads wishing to enter vehicle recovery service. Here’s a selection of Dinky and Zebra. Varying degrees of detail, but nonetheless that doesn’t detract from playability. An old postcard from sometime in the fifties of the small town of Wooler in North Northumberland. 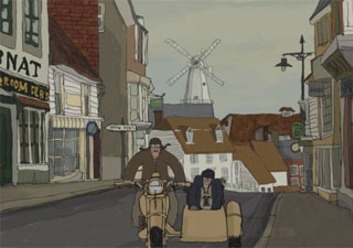 Here a idyllic quiet scene along the High Street. This is where I grew up and have fond memories of the beautiful countryside around and the muckle Cheviot Hills behind. Well, a lone ‘driver’ of what looks like an AA combination is tooling along in this image, and my family have a strong suspicion that this is my grandfather George Lawrie; he was an AA Patrolman during that time and was one of the only ones in that corner of the country. Today we’ll go full size: here’s the actual Beeza AA combination also known as the ‘Road Service Outfit’ in gorgeous yellow. They’ll definitely see you coming along the road with this one! These days the patrolmen tote around on easy riding motos such as the Honda Deauville, sweet 650cc V-twin, and the Burgman scooter, another 650cc ride. Jumper cables tucked in one of the panniers, no tonneau cover’d sidecar now. A tiny three wheeled combination in yellow and black. This midget amongst small things has been sitting waiting to be painted and assembled (all three pieces of it!) Well I finally got around to it with as delicate a hand as I could muster. 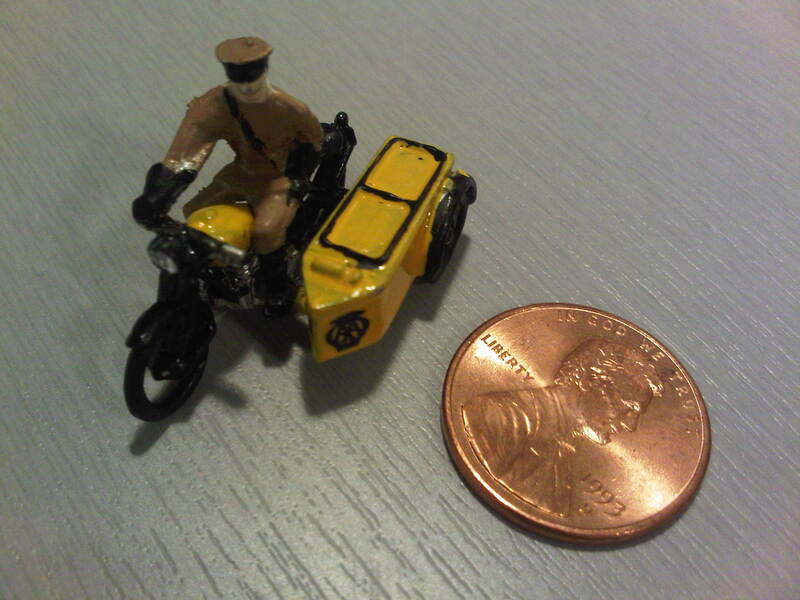 This is of course a miniature of the AA’s BSA sidecar outfit used in the forties and fifties to aid broken down vehicles. Probably the very same model my Grandfather rode whilst an officer in the Association. Indeed it was his experience with traffic and vehicles that directed him to the Military Police in WWII.